^ Modern Guitars TB1000A reaches $312,000. ^ a b Jackson, Blair (1999). Garcia: An American Life. Penguin Books. pp. 1, 2, 5. ISBN 0-14-029199-7. http://books.google.com/books?id=w3y3PbFPNe4C&printsec=frontcover#v=onepage&q&f=false. ^ McNally, Dennis (2002). A Long Strange Trip: The Inside Story of the Grateful Dead. Broadway Books. ISBN 0-7679-1185-7. ^ Troy, Sandy (1994). Captain Trips: A Biography of Jerry Garcia. Thunder's Mouth Press. ISBN 1-56025-076-3. ^ a b c d e f g h i j k l m n o p q r s t u v w x y z Lesh, Phil (2005). Searching for the Sound: My Life with the Grateful Dead. Little, Brown and Company. ISBN 0-316-00998-9. 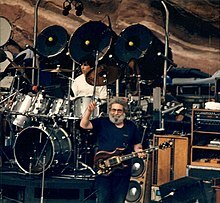 ^ "Garcia, Jerry." Encyclopedia of Popular Music, 4th ed.. Oxford Music Online. Oxford University Press, accessed September 29, 2014. ^ Kahn, Alice (1984). Jerry Garcia and the Call of the Weird. originally appeared San Jose Mercury News, 12/1984, included in The Grateful Dead Reader on Google Books. http://books.google.com/books?id=BsutWd7d_FoC&pg=PA202&lpg=PA202&dq=perry+lane+lesh&source=web&ots=D0Q2ZUd_-R&sig=V7z7ni2d8_3QnITTBFmoaQQqfnM&hl=en&sa=X&oi=book_result&resnum=7&ct=result 2008年8月7日閲覧。. ^ Stories about the "Grateful Dead" appear in many cultures. ^ “Black Mountain Boys”. 1999年10月22日時点のオリジナルよりアーカイブ。2013年4月12日閲覧。 photo at eyecandypromo.com. Retrieved April 12, 2013. ^ Dennis McNally, A Long Strange Trip, 2002, pg 614. ^ Carlin, Plter (January 27, 1997). “War of the Wives”. People. http://www.people.com/people/archive/article/0,,20143324,00.html. ^ Gulla, Bob (2009). Guitar Gods: The 25 Players who Made Rock History. ABC-CLIO. ISBN 978-0-31335-806-7. ^ Beat Instrumental & International Recording. p. 52. http://books.google.co.uk/books?id=yGdLAAAAYAAJ&q=emmons+d10+garcia&dq=emmons+d10+garcia&hl=en&sa=X&ei=SaWpU7zeD4LcOYeQgNAF&ved=0CCMQ6AEwAQ. ^ Trager, O. (1997). The American Book of the Dead. A Fireside book. Touchstone. p. 137. ISBN 978-0-684-81402-5. http://books.google.com/books?id=TbRsHp57CqwC&pg=PA137 2016年2月3日閲覧。. ^ Liberatore, Paul (July 17, 2015). "Jerry Garcia Foundation Uses Grateful Dead Icon's Art for 'Greater Good'", Marin Independent Journal. Retrieved August 4, 2015. ^ Chadbourne, Eugene. Heavy Turbulence at AllMusic. Retrieved February 10, 2016. ^ Heavy Turbulence, Jerry Garcia official website. Retrieved February 10, 2016. ^ Chadbourne, Eugene. Fire Up at AllMusic. Retrieved February 10, 2016. ^ Fire Up, Jerry Garcia official website. Retrieved February 10, 2016. ^ Thomas, Mike (April 13, 2012). "Jerry Garcia, David Grisman and Tony Rice: The Pizza Tapes (Extra Large Edition), Relix. Retrieved February 10, 2016. ^ Jackson, Blair (May 6, 2010). "Acoustic Oasis Offers 'X-Large' Serving of The Pizza Tapes", dead.net. Retrieved February 10, 2016. ^ "Garcia/Grisman, Alternate Garcia/Grisman and Hi-Def Folk Released on Acoustic Oasis", Relix, August 1, 2012. Retrieved February 10, 2016. ^ Relfman, Sara (August 10, 2012). "David Grisman Updates the Garcia/Grisman Classic, Grateful Dawg", Grateful Web. Retrieved February 10, 2016. ^ Planer, Lindsay. Marrying Maiden at AllMusic. Retrieved February 10, 2016. ^ Watchfire at AllMusic. Retrieved February 10, 2016. ^ Planer, Lindsay. Blues from the Rainforest at AllMusic. Retrieved February 16, 2016. ^ Ruhlmann, William. Superstitious Blues at AllMusic. Retrieved February 10, 2016. ^ Carruthers, Sean. Devout Catalyst at AllMusic. Retrieved February 10, 2016. ^ Meyer, Richard. Trios at AllMusic. Retrieved February 10, 2016.